BarreAmped is the result of more than 10 years of physiological study and client observations by one of America’s top fitness talents. BarreAmped is not taught with a strong pelvic tuck which is classic to other barre exercise methods. BarreAmped instead teaches the student to focus control on the “Core Base,” which is the pelvic floor muscles and lower abdominal wall, in order to maintain torso control and a neutral spine. 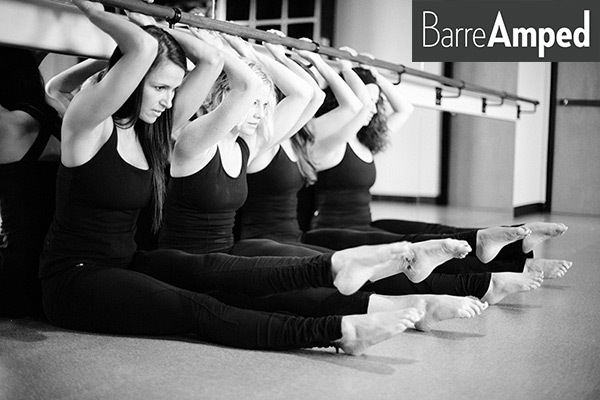 BarreAmped is a modern interpretation of a classic method. Our classes are filled with all types of people at different skill levels. Come experience a BarreAmped class for yourself & see the difference! Most barre workouts today have their roots in the Lotte Berk Method, which was brought to America by Lydia Bach in 1970 and first taught in the Lotte Berk Method Studios in New York City. Lotte Berk herself was a German dancer who fled the Nazis during World War II. She moved to London with her British husband, kept dancing, but suffered a back injury falling off the stage. During her recovery, Berk worked with orthopedic doctors, combining her rehabilitative therapy with ballet barre work to form a new system of exercise. BarreAmped® is a direct descendant of the original Lotte Berk Method. Suzanne Bowen, an international fitness celebrity and former Lotte Berk Method instructor at the Lotte Berk Method Studios, founded BarreAmped® after more than 10 years of precise training in the method under the direct tutelage of Bach herself, physiological study, and client observations. A second generation barre instructor, Bowen therefore created an undiluted form of barre work with a strong focus on form in order to get the true benefits of using classic barre techniques. Her method emphasizes neutral spine and pelvic floor engagement to fire up the core. BarreAmped Fire is a great class for experienced BarreAmped clients. It relies heavily on the client’s proven technique, flexibility, & strength. It includes full range of motion moves, quick transitions, elements of cardio, and advanced dynamic stretching. A minimum of at least 10 BarreAmped classes is recommended before entering this class.